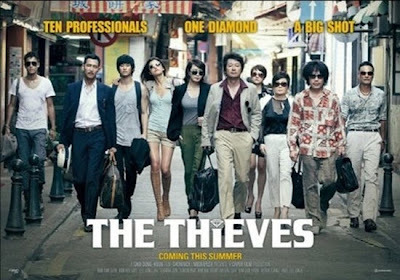 “The Thieves,” the film boasting an A-list cast featuring Lee Jung-Jae, Jeon Ji Hyun, Kim Soo-Hyun, Angelica Lee, Simon Yam, Derek Tsang, Kim Yun Seok, Kim Hye-Soo, Kim Hae-Suk and Oh Dal-Su is set to hit Malaysian cinemas third quarter of 2012. The film which participated in the recent Hong Kong Film Mart is generating great buzz and anticipation. Distributor: Gala Entertainment Sdn. Bhd. Korea's answer to Ocean's Eleven, the heist film is the fourth feature film from director Choi Dong-hoon who helmed big hits such as Tazza: The High Rollers and Big Swindle. Shot in Macau, Hong Kong, and Korea, the film centres on a group of criminals with different skills and agendas who conspire to steal a grand diamond called, "The Tears of the Sun." In order to let things cool down from their latest heist, Popeye (Lee Jung-Jae) and his group of thieves go to Macao on a job. But the mastermind behind this job is none other than Popeye's old partner Macao Park (Kim Yun-Seok), who escaped with 68kg of gold several years ago on their last job together. Macao Park brought Chinese thieves as well but little did they know what Macao Park planned for each one of them. But his plan takes an unexpected turn when Popeye brings Pepsi (Kim Hye-Soo), an old flame of Macao Park, to settle the old score. The thieves' target is a $20 million diamond known as 'Tear of the Sun', kept safely away in a casino, brought there to be sold by a notorious Chinese fence. While working together to steal this fabled diamond, they all have their own agenda to keep the diamond for themselves. But who will succeed and live to see another day? Dazzling ensemble cast, fast paced, stylish and entertaining, The Thieves is not to be missed. Sessions with Heineken at 7atenine Returns!